Michael Wolfe must pick the best beer for his masterfully designed German bread recipe. The judges are impressed with the design of his "Bread Week" showstopper bake that was inspired by one of his mother's Christmas broaches. 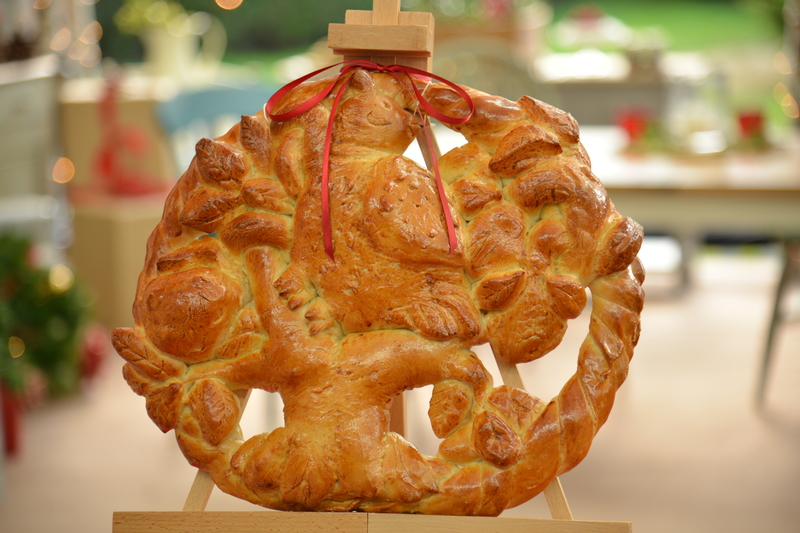 His Partridge in a Pear Tree bake is a tribute to his mother and is comprised of pretzel dough made with beer. Watch the full "Bread Week" episode from Season 2 Episode 3 of The Great American Baking Show to see if Michael's bread tastes as good as it looks. Get the full recipe below. 1. Combine water and sugar, mix until sugar dissolves. 2. Add yeast to water, stir, and place in warm area for 5 min. 3. Add salt and oil, and stir well. 4. Next, start adding flour until a soft mass/ball forms and the dough is no longer sticky. 5. Knead the dough for about 10 min. until smooth. 6. Divide dough and shape into desired forms. Various part/pieces can be stuck together with water and your finger. 7. Proof the dough in a warm environment for 10-30 min. 8. Bake at 350F (180C) for 20-45 min. depending on size of sculpture.